Many people who are looking to build a shed naturally want to know how the process works. And one of the main questions we get is, “How does council approval for sheds work?”. This article answers all the questions we get around shed council approval, so you can build your new shed with a minimum of hassle. This article covers the general council approval process that applies throughout Australia. It’s essential to contact your local council to get the details of the specific process that applies in your area. When is Council Approval for a shed required? The first question we’re often asked is, “Will I need council approval for my shed?”. These days, council approval is nearly always required. Different states and councils do have some exemptions, but they always have lots of conditions. So it’s always best to check with your local council before going too far. In a worst case scenario, council can make you take an unapproved shed down and remove any concrete or footings. Getting retrospective approval after you’ve already built your shed is almost impossible. The best option is to get a permit not to have it demolished. We have heard stories from shed builders who have gone through the process of getting permission to keep non-approved buildings standing. Sometimes the process can take several years. In one case, the person had to spend over $100,000.00 in engineering reports, application fees and various rectification work to get the building to the required standards. This is the type of hassle that can be easily avoided. The biggest reason to obtain approval, is that when you sell your property, part of the conveyancing process is to get confirmation from council that all structures are approved and built to conform with all regulations. Without the correct approvals, the purchaser can withdraw from the sale and get their deposit back. Preliminary Design: get a preliminary shed design drawn up (we offer a free service to do this for you). Preliminary Discussion: Once you’re happy with your design, get in touch with your local council to start a preliminary discussion (see below). Preliminary Feedback: Council may give you feedback which will affect your design and may require some design modifications – or they may indicate your design is likely to be compliant (happy days!). Preliminary Refinements: Make the necessary changes to your preliminary design (again, this is free of charge when you take advantage of our shed design and quote service). Formal Application: Put your plans into council for as part of a formal application. If you’ve done your homework, approval should generally be straightforward. Final Refinements: if the council has any further requests for changes, tweak your design and revert back to council – although if you’ve followed steps 1 to 4, you shouldn’t have much to do here. 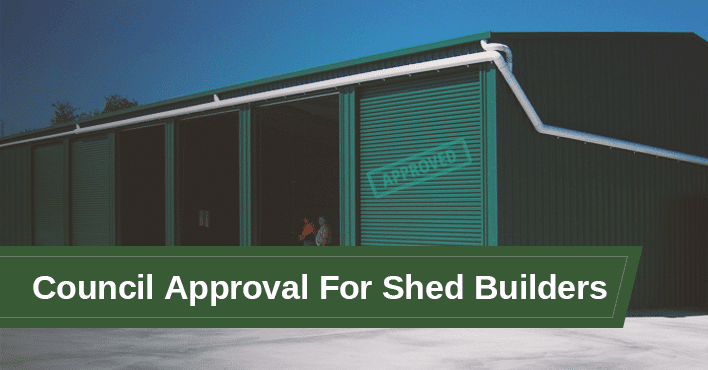 Approval: Once approved, you’re ready to order your shed and start building! Step 2 of the process is to hold a Preliminary Discussion with council. A site layout plan showing the boundaries and dimensions of your block. You should have received a site plan with the conveyancing paperwork when you purchased the property or with the approvals for any previous developments you have had done. Failing this, for a small fee, you can get a copy of the last approved plans the council has on file. A Preliminary Design, or at the very least a sketch of the shed you propose. What size can I build without a permit? What is the minimum (or maximum) shed height permitted? How far does a shed have to be from the boundary fence? We’ve found that if you get the inspectors involved right from the start, you can ask for their help in getting your council application correct on the first go. This makes both your life and their job a lot easier. Usually they are only too happy to help point out any issues they foresee, and how to address them. Step 5 is making a Formal Approval Application To Council. The first step is to find out how your council or certifier accepts applications. Whilst most applications are still in paper form, a number of councils now insist on the application being in electronic format. Once your application is lodged, you’ll either get an approval, a request for changes, or a rejection. If you do steps 1 through 4 thoroughly, then you will usually find that your shed approval sails through council. However, sometimes council will request some revisions to your design in order to grant approval. This could be due to easements, sewer line locations being different to submitted plans, power line locations or other factors. This means going back to your shed company to tweak your design plans and re-submit to council until they are happy. If you need to tweak your design, we’re happy to help you with this at no cost. Sometimes, shed builders are disappointed to find that the type of shed they want to build will not be approved by council. We recently worked with a customer to design a magnificent custom shed with a wall height of 3.9m and 160sqm in area. Unfortunately, council stipulated that sheds in their suburb may only have a maximum wall height of 2.4m and be up to only 60sqm in area. The customer had to unfortunately give up their dream of having that shed on that property… but they’re currently looking for a bigger property elsewhere! When is your shed exempt from Council Approval? There are some cases where your shed is exempt from council approval. This varies from state to state and even council to council. If you go to your local council and there is an exemption for what you are wanting to build, they will let you know. If possible, get something in writing to say your proposed shed is exempt (even if you have to pay a fee). That way you can keep it on file in case there are any questions or problems in the years to come. Whatever you do, don’t just take the advice of a neighbour, friend or salesperson to the effect that “you don’t need approval for sheds around here”, as the consequences are too severe. Many times we’ve had customers tell us they have been “told” they don’t need any approvals, but when we do the proper checks, we find out they do. In NSW, for example, there is an exemption for farm sheds on rural land up to 200m2, but there is some important fine print: the shed must be “ancillary to an agricultural activity”. That is, it must be solely used as a part of a working farm. If you put your caravan or boat in there, the shed is not exempt. In another case, we had a client wanting to build a shed on their rural-zoned block to store their tractor and trailer that they used to keep the land maintained. This shed was not exempt as there was no “agricultural activity” on the land. A couple of cows to keep the grass down didn’t count. There are also a many other clauses that detail other potential reasons why a building may not be exempt, such as acid sulphate soils, presence of indigenous artefacts, heritage orders, distances to boundaries or neighbours dwellings – to name just a few. Bottom line, check with the council or a private certifier, just to be sure. Then if they say you’re exempt, get it in writing. Should you use a Private Building Certifier? The role of a Private Certifier is to make gaining council approval quicker and easier. They are not available in some areas or states but when they are, they can be a good option. They follow the same rules and guidelines as the council inspector, but are usually very knowledgeable about shortcuts and exemptions as well. They check all necessary regulations, confirm all your paperwork is correct and issue the approvals. They can also perform all relevant stage inspections, then issue the final occupation certificate as well. Finally, they provide council with all the completed paperwork and approvals for their records. In some cases, council may check your advise that approval isn’t required, but will not give you anything in writing for your records to that effect. This is also where a Private Certifier can come in handy. A letter from them saying they have checked your plans and current regulations, and are satisfied that approvals are not required, which can give you added peace of mind for the future. 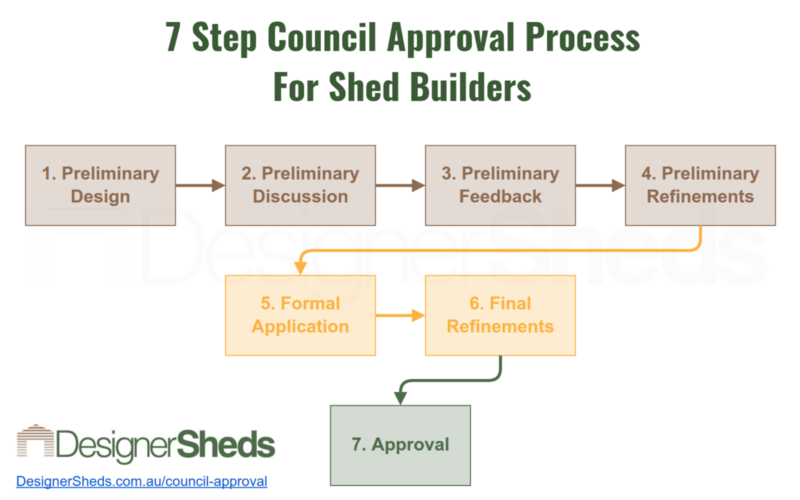 If you can develop a good rapport with your local council or a private certifier right from the start, the council approval process for sheds is actually simple and straightforward. While it may be tempting to not seek approval (particularly in rural areas), the ramifications down the track will always be much worse and a lot harder. If you’re ready to embark on Step 1 and get your Preliminary Design drawn up, get in touch for a free shed design and quote session with one of our expert Shedologists. We’ll email you your preliminary shed plans, suitable for Step 2 (Preliminary Discussion with council). Then once your design is finalised, all you have to do is pay a 10% deposit on your shed kit and we’ll supply all the final plans and engineering documents you’ll need for Step 5: Formal Application. At any stage along the way, if you need to tweak your design, we’ll be happy to do that for you – at no cost. Good luck getting your shed approved – and here’s to your best shed ever!